Rafflesia is the largest flower on earth, measuring up to 1.5 m across. Incredibly it has never been grown outside of its native range. One of the most fascinating plants I can think of is rafflesia, which is the largest flower on earth. The most spectacular of the 30 or so species which grow in the rainforests of Southeast Asia is R. arnoldii, which produces flowers which can measure up to an incredible 1.5 m across, and weigh over 10 kg. 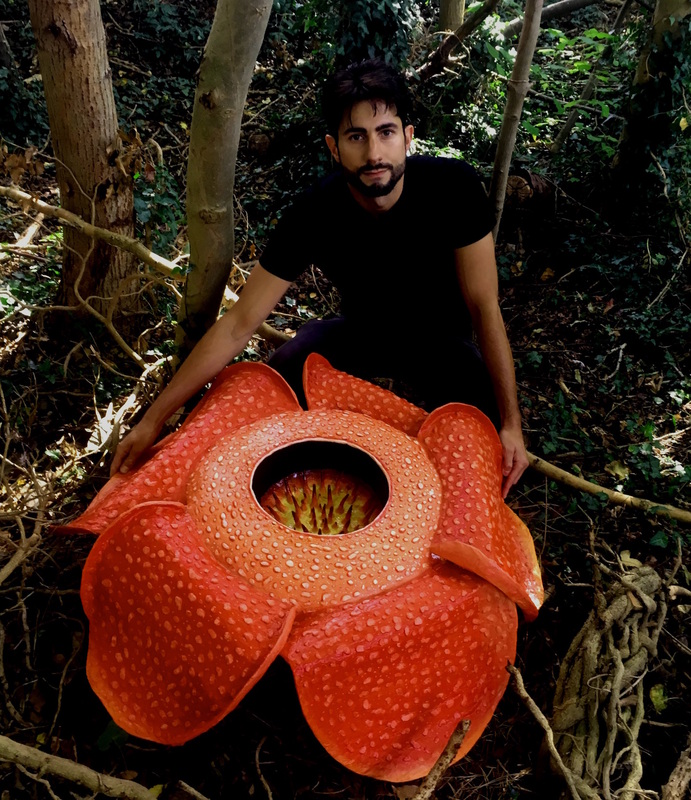 Not only is it gigantic, rafflesia has a peculiar and somewhat sinister life history. The plant is a parasite, meaning it steals all of its nutrients from the roots of other plants. It has no chlorophyll, leaves or roots, and spends most of its life embedded within the tissues of its host plant (a tropical vine) as a network of fibres. When mature, it eventually sends up its enormous blooms on the rainforest floor which unfurl from gigantic, cabbage-like buds. These extraordinary flowers have evolved to look and smell like rotting flesh to attract pollinating flies. 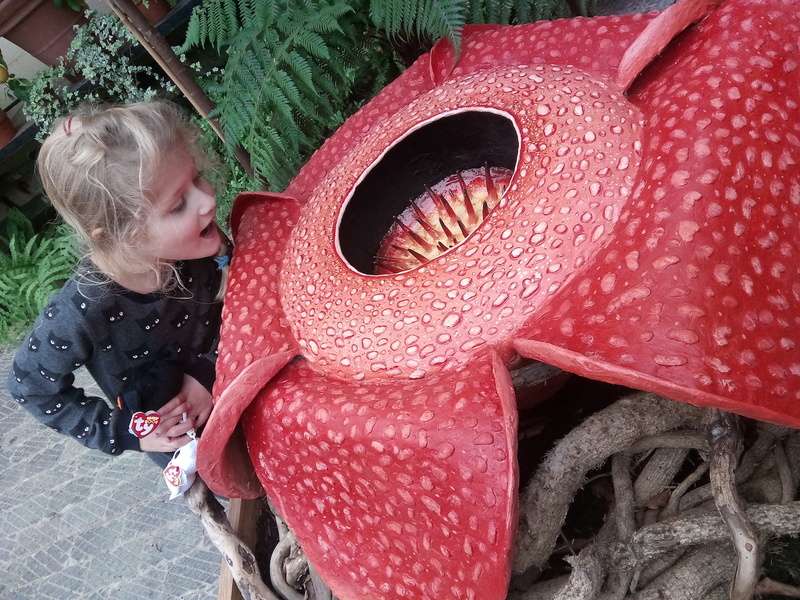 The monstrous size of the flower may be a powerful means of broadcasting its smell across the dingy rainforest floor to attract flies from far and wide. It clearly has the potential to be a crowd pleaser, but growing ‘the real thing’ is a gigantic challenge. 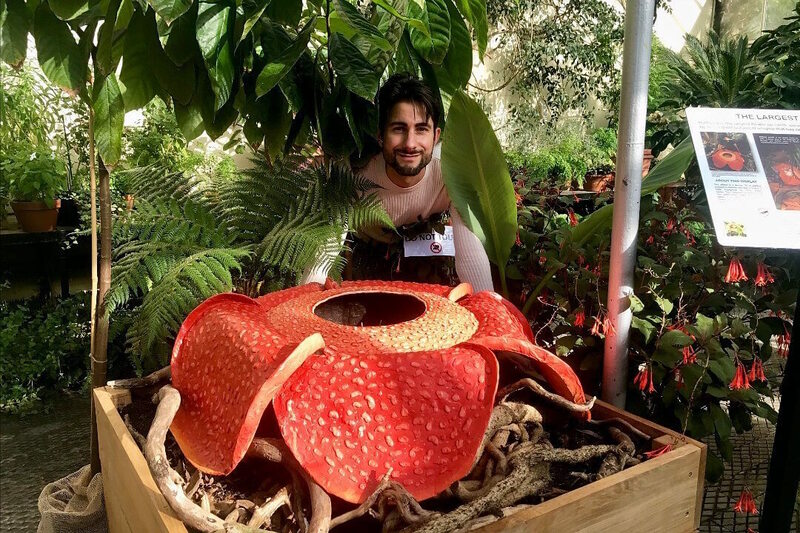 Cultivating rafflesia is a long-term ambition of Oxford Botanic Garden, like many botanic gardens. But owing to its parasitic life style, its rarity and its very particular requirements, no one has yet succeeded in cultivating it outside of its native Southeast Asian rainforests. Rafflesia flowers are very rare in the wild and few people are lucky enough to see them. For that reason, I set out to create a life-size replica of the plant that we would display for just 8 days – the length of time the plant blooms for. I have painted this plant in oil paints before, but recreating the plant in 3D seemed like the perfect way to really bring this elusive monster of a plant to life. The ambition in short, was to give people as close an experience as possible to seeing one of the most enigmatic species in the Plant Kingdom. The construction of the 3D oil painting involved building up layers of papier-mâché which were coated in plaster (left), with details added in modelling clay (centre), and then finished in oil paints (right). The replica is a ‘3D oil painting’, constructed largely from papier-mâché. I started by creating a rigid frame made up of dismantled cardboard boxes and masking tape. I used photographs I have taken of the plant in Borneo, as well as pictures in books, to ensure that the relative dimensions and shape were exactly right. I then built up this frame with layer upon layer of papier-mâché, over the course of several weeks. Quite simply, this involved tearing up recycled newspapers, and layering with a mixture of flour and hot salt water. After 3 weeks’ drying time, I then refined the surface of the model with plaster, which I later smoothed down with sandpaper. I added detail to the surface with modelling clay (a thousand or so warts on the giant petals), which I fixed with PVA glue. Finally, I painted the model; first with quick-drying red emulsion paint as a base layer, and then with oil paints in consecutive layers. We displayed the flower in a giant wooden box on a bed of vines (sustainably sourced ivy stems!) with a backdrop of tropical potted plants, and alongside an interpretation board to explain what the display was for. Here you can watch a Facebook Live video and learn more about the giant creation. 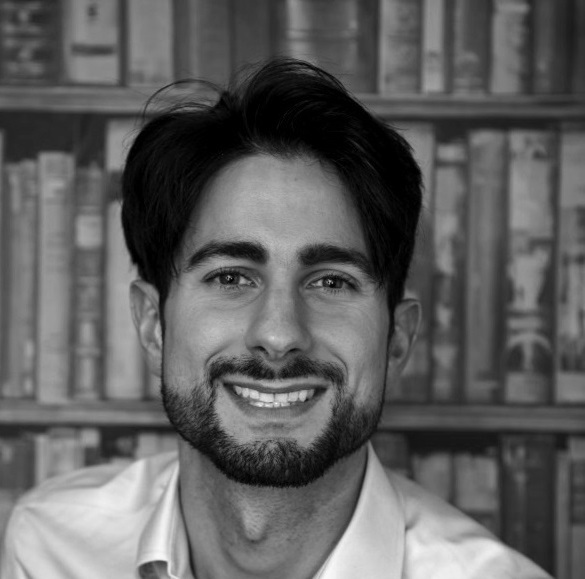 The model generated significant social media activity following another Facebook Live video with Oxford Sparks and was featured in local and regional media (Oxford Mail, Oxford Times), being featured on South BBC Today and a live BBC Facebook Live. Statistics: >14K views on University Facebook, >3.3K views on BBC Facebook, >11k impressions made on individual tweets, three bulletins on BBC South Today (morning, lunchtime and evening) news on 26 October, and an interview on BBC Oxford radio news.